Over the past few years, Exchange Street in Middlebury has become a hub for those who want to imbibe local. Among its occupants are Stonecutter Spirits, Otter Creek Brewing Company, Woodchuck Cider, Appalachian Gap Distillery, Aqua Vitea Kombucha and Vermont Coffee Company. Now, Middlebury's hippest street is about to get arty: Vermont Coffee Company has opened a theater. Last weekend, the Vermont Coffee Company Playhouse hosted a debut party and performance directed by and starring Deb Gwinn, wife of VCC owner Paul Ralston. "Our whole thing is about bringing people together," Ralston said. "What do people do in communities? They talk; they eat; they do art; they share their creativity." According to Ralston, opening a theater was always part of the plan. "This is one of the reasons that we roast coffee," he said. "You have to pay to do your art. It's hard to get people to pay you for your art." And if coffee helped fund the theater, Ralston added, the theater will help promote the coffee. "In the crudest sense, it's part of our marketing," he said. Gwinn is known locally for directing 18 seasons of Shakespeare in the Barn at Mary's Restaurant at the Inn at Baldwin Creek in Bristol. For the past six years, she has mounted invitation-only performances in a teeny-tiny Middlebury studio in the building that currently houses the toy shop Ollie's Other Place. Now, Gwinn said, she's thrilled to have a larger venue. The VCC playhouse is a 70-seat "gray-box" theater: Gray curtains enclose the space. "We needed to soften our walls, and we just thought black would be too dark," she explained. Chairs and "retired" lighting were obtained from Middlebury College, and Ralston built the low stage in VCC's on-site woodshop. "It's really an industrial warehouse vibe," he said. "It's not a high-end theater." Gwinn will serve as artistic director of the playhouse. So far, she has booked Gare St Lazare Ireland for a couple of shows in October. Gwinn calls the theater troupe, which adapts Samuel Beckett's prose pieces for the stage, "a personal favorite." 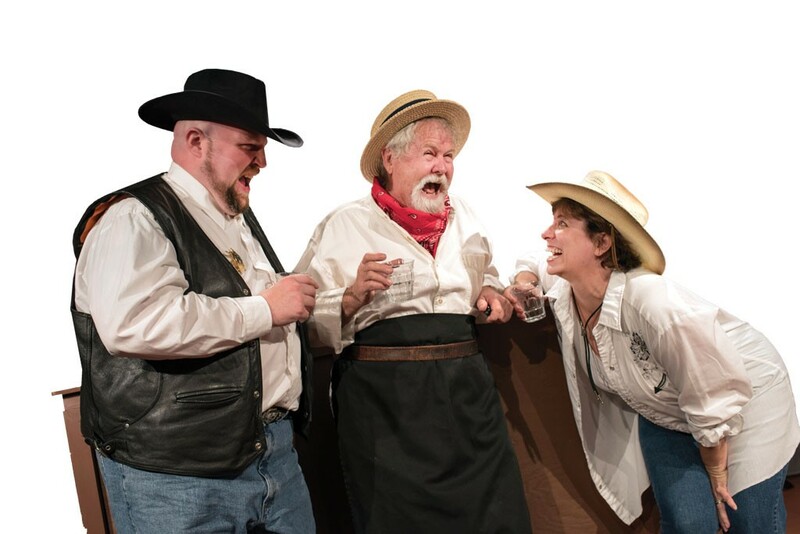 For the opening event last weekend, Gwinn enlisted local actors to perform her new work "Billy the Kid Sister." The 20-minute comedy was inspired by and set to Aaron Copland's 1938 ballet Billy the Kid. There was no dialogue. "It's acting to music," explained Gwinn. "It's not unlike dance, but we don't call it that. Some people feel it's kind of like a silent movie." Ralston is also planning to occupy the theater on some nights. The former Vermont state senator currently records his WDEV show "The Reluctant Politician" in a studio in the VCC building. He hopes to do live studio recordings of that show in the playhouse, as well as live radio dramas. "Our hope is that, once a month, we have things happening here," said Ralston, who sees the theater as part of Exchange Street's renaissance. He'd like to see the former industrial thoroughfare become a vibrant arts and culture hub, much like Pine Street in Burlington's South End, he added. The first order of business: getting the street a sidewalk. The Vermont Coffee Company Playhouse, 1197 Exchange Street in Middlebury. playhouse@vermontcoffeecompany.com. The original print version of this article was headlined "Play's the Thing"